The 26th Annual Meeting of the Asia-Pacific Parliamentary Forum (APPF-26), themed “Parliamentary partnership for peace, innovation and sustainable development”, is to open in Hanoi on January 18 with three key meetings scheduled for the day. The first working day of the APPF-26 consists of the Meeting of Women Parliamentarians, Meeting of Secretaries and Advisors of the delegations, and Executive Committee Meeting. The Meeting of Women Parliamentarians of the APPF was held for the first time during APPF-24 in Canada in January 2016, following an initiative from the Indonesian delegation to the APPF-23. Being the third edition this year, the APPF Meeting of Women Parliamentarians aims at promoting gender equality for sustainable development and shared prosperity. This year, the Japanese delegation proposed a draft amendment of the New APPF Rules of Procedure to include the Meeting of Women Parliamentarians as a permanent event of future APPF meetings. 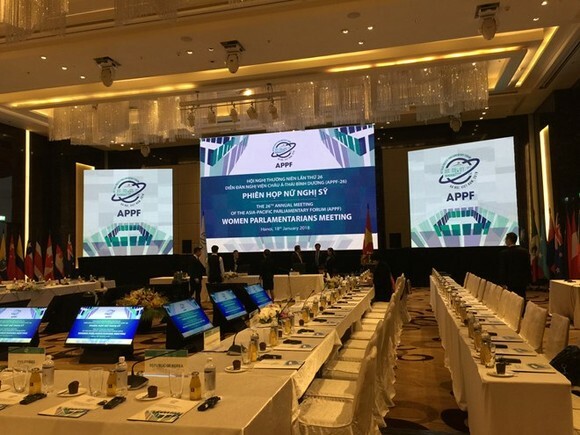 The APPF Executive Committee, which is responsible for matters relevant to the management of the event, comprises representatives of two countries from each of the APPF´s sub-region. The current Executive Committee members are Russia and Mongolia (representing Northeast Asia), Indonesia and Laos (Southeast Asia), New Zealand and Papua New Guinea (Oceania), and Chile and Canada (the Americas), along with representatives from the current and upcoming host countries. Lasting until January 21, the APPF-26 also features four plenary sessions on the topics of politics-security, economics-trade, regional cooperation in Asia-Pacific, and the future of APPF. Thirty-four bilateral meetings are scheduled to take place on the sidelines of the meeting. By January 16, 11 participating APPF members submitted 44 draft resolutions, including six from Vietnam. By the end of its course, the meeting is expected to adopt resolutions and issue the Hanoi Declaration. The APPF was officially formed in Tokyo, Japan, in 1993. The forum now gathers 27 members, namely Australia, Cambodia, Canada, China, Chile, Colombia, Costa Rica, Ecuador, Fiji, Indonesia, Japan, Laos, Malaysia, the Marshall Islands, Mexico, Micronesia, Mongolia, New Zealand, Papua New Guinea, Peru, the Philippines, the Republic of Korea, Russia, Singapore, Thailand, the US, and Vietnam. The APPF is a mechanism that enables parliamentarians to discuss issues of common concern, and to deepen their understanding of the region and the interests and experience of its diverse members. The forum’s proceedings address political, security, economic, social and cultural issues, thus furthering regional cooperation and building relations between and among parliamentarians from the Asia-Pacific region.